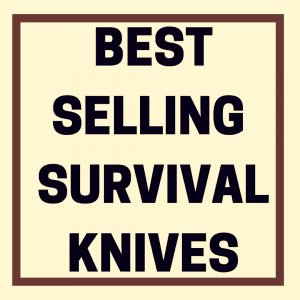 You are here: Home / Survival Knife / What’s the Best Bowie Knife for Survival? Made famous by such unforgettable big-screen characters as Rambo and Crocodile Dundee (“That’s not a knife…”), the Bowie knife has long held the attention and imaginations of little boys and girls everywhere with the size, clip point tip, and cross guard that give it such a distinctive look. Given the prevalent attitude of “bigger is better,” it stands to reason that the Bowie knife, which can reach lengths of up to 30” overall in some instances, has a host of loyalists who tout its supremacy regardless of occasion, circumstance, or context. For myself, I’m not so black-and-white. For example, I’m not sure that the Bowie is the best of all the vast types of knives to help me survive in the wilderness. From its inception, the Bowie was designed primarily as a fighting knife in hand-to-hand combat, an application that still shows in its identifying characteristics. A narrower and thinner clip point (often double-edged) flaring out to the characteristically larger width blade meant an easier entry into an opponent, while the cross guard provided slight protection for the fingers from an opponent’s blade. The tradeoff in such a blade design comes in the fragility that thinning a blade naturally introduces to the overall structure. However, for those staunch purists who demand a Bowie that can stand up to the rigors of a true survival knife application, this article is for you, as we’ll be discussing five of the best (in my opinion) survival Bowie knives that are on the market today. For a more in-depth discussion of why these and some other survival blade characteristics are important to consider, you can refer to this article by Creek Stewart of the Willow Haven Outdoor School for Survival, Preparedness & Bushcraft, and this one featuring Dave Canterbury of the Pathfinder School. 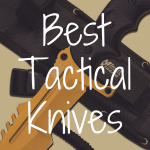 Taking the above into consideration, I’d recommend starting with one of the following Bowies to meet your survival needs. Perhaps most famous for their USMC fighting knife, Ka-Bar also produces the Becker BK9, a 14-3/4″ behemoth that combines an American Bowie-style blade with their penchant for tactical functionalities and design. There’s a reason that the Ka-Bar fighting knife has been an American icon and standard for many years. 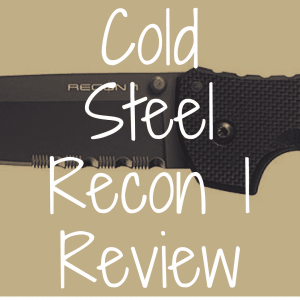 Ka-Bar delivers on their products. 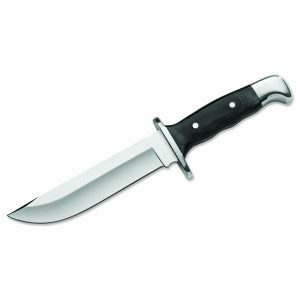 The Becker BK9 takes the durability and tradition of the fighting knife and delivers it in a package designed for the field and the bush. 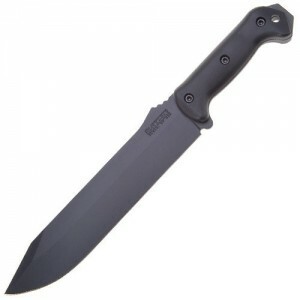 The full-tang design gives not only more strength and durability to the knife overall, but also makes it better suited to tasks above and beyond combat. The black powder coating not only reduces reflectivity (stealth combat necessity), but also protects against the rusting of this high carbon steel tool. The coating makes it less suitable to firestarting with a piece of flint, but the spine provides a suitable surface to use with a good ferro rod. The steel of this blade is designed to be strong and durable, but that strength can come at the price of holding an ultra-fine edge for long. As a general rule, the more durable the metal, the more time and attention necessary to preserve a fine edge; the sharper the knife, the more brittle the metal is, and the less durable the knife may be, overall. The BK9 tries to find the balance between these two. 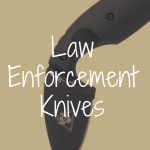 This significant price difference between the Junglas and the BK9 could be attributed to primarily three significant differences: length, handle material, and sheath options. The Junglas is nearly 2″ longer than the BK9. This extra length gives it more heft in a swing, making it slightly better suited to chopping tasks like clearing brush or thick vines (thus it’s jungle heritage and name), like a short machete. More length = more metal = more cost. Esee also opted for a higher quality handle material, using canvas micarta instead of molded plastic. These give the Junglas better grip under wet conditions, as well as being more durable and resilient. The sheath comes in black molded kydex with adjustable retention, lanyard holes, and pommel cover. Altogether, the Junglas and the BK9 are not so different in form or function, but Esee decided to opt for more luxury in their add-ons, which is reflected in the price point. Bowie purists will rejoice when they see the ultra traditional styling of this knife on your hip. From the significant width and exaggerated clip point of the blade, down to the brass-plated crossguards, the Western Outlaw is a Bowie to make Dundee proud. A stainless steel full-tang blade means that you’ll have a sharp edge that will resist rust and need very little maintenance to stay both sharp and pristine. The straight spine gives you a decent edge to be able to throw sparks from a ferro rod, but stainless steel is not superb as a steel striker with flint. 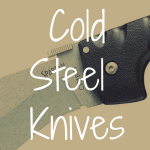 Additionally, stainless steel is not as strong or resilient as a knife made from high carbon steel, meaning that the Western Outlaw may not be the best knife for prolonged use in bushcraft tasks like processing larger pieces of wood. However, if you’re looking for a knife that looks great, holds a superior edge, and can perform survival tasks if necessary, all while keeping your pocketbook fat, certainly consider the Timber Rattler Western Outlaw Bowie Knife. The Frontiersman offers a package that delivers subtlety, efficiency, and quality in one appealing package. Although not as grandiose in scale or appearance as the Western Outlaw, the Frontiersman fills a similar niche as the bigger knife, just with more quality and guarantee. Made of a higher-quality Stainless steel, the Frontiersman takes a step further than the Western Outlaw in terms of blade durability. 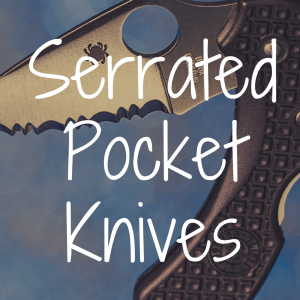 The handles, too, bespeak quality; micarta non-removable scales provide better grip and resistance to damage than the wood handle of the Western Outlaw. The Frontiersman performs beautifully as a hunting knife for those who want a knife that large and strong enough to process larger game and the occasional woodpile while looking like a million bucks. Throw in Buck’s Forever Warranty, and you’re riding pretty with a knife that feels equally at home in the bush and as a conversation piece at a fancy dinner party (better check with your host, first). Though perhaps not a Bowie in the strictest and most traditional sense, the Mora Bushcraft Pathfinder has enough of the traits and more than enough of the oomph to at least warrant a closer look from someone interested in a Bowie fit for survival. Blade surface: black anti-corrosive DLC-coating. 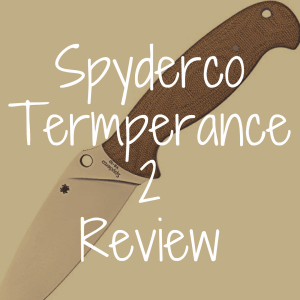 If you’re looking for a knife with the shock-and-awe of Rambo or Mick Dundee, keep right on looking. 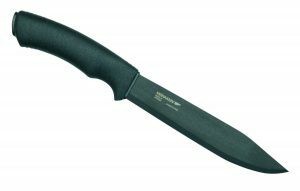 But, if you’re looking for a knife that will undoubtedly hold up to the rigors of real and rugged use and abuse in the field, look no further than the Pathfinder. Although only recently even foraying into full-tang territory in the US, Mora has long had a reputation for making knives that hold up remarkably well to hard use, 3/4 length tang or not. You can watch a Pathfinder be put through the ringer by Dave Canterbury and come out on top here. The length, material, and spine on the Pathfinder make it perfectly suited for true burly survival tasks like processing even slightly larger diameter logs for fire-making and shelter building. Like many other more contemporary knives and others included here, the coating on this knife blade means that you won’t be throwing any sparks from it with a flint, but that same coating also means less time and attention necessary to prevent rusting in this high-carbon blade. As with everything, it’s about tradeoffs. The spine is deliberately kept at a stark 90° to throw sparks from a ferrocerium rod that would make a 4th of July sparkler jealous. A hardy addition to this lineup, the Pathfinder will not disappoint anyone looking for a knife that can handle the very toughest survival tasks you can put it through. The takeaway from an article like this one should not be that there is one knife that is innately superior to all others in its class. Instead, one needs to take into account exactly what type of activities and jobs one will engage in with that knife, and get the best knife for that job. Inevitably, however, it is universally agreed that the best and most useful knife is the one that you have with you. What Are the Best Machetes for Survival?